As businesses moved online to websites and apps, UX and UI designers became some of the most coveted workforce assets in the market. 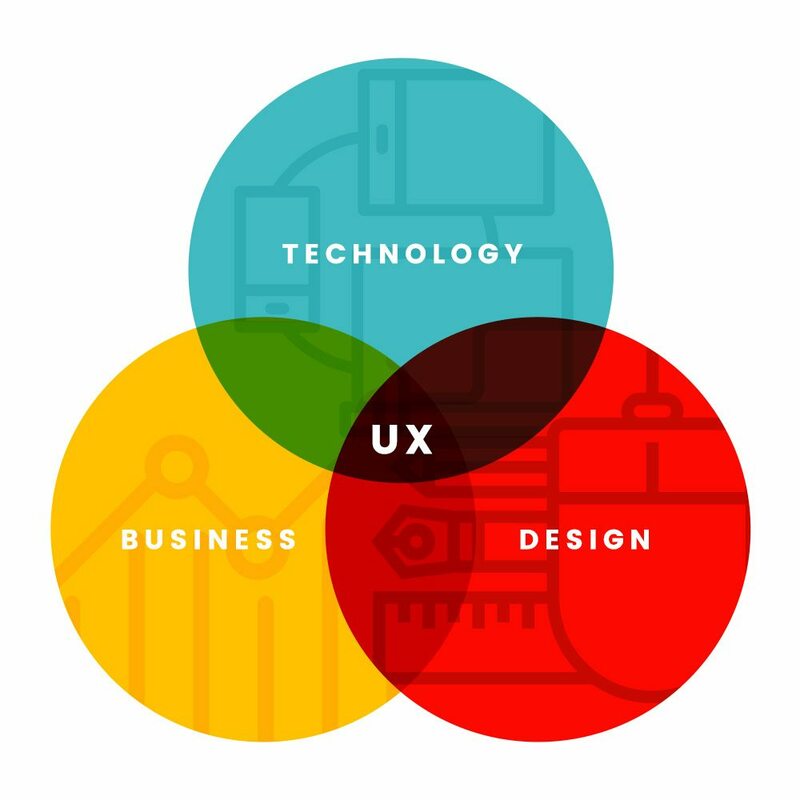 A great UX designer, and conversely a great UX for your website, meant better engagement, higher conversions, more leads, and hopefully, more sales. And in a crowded field (1.6 billion websites and 4 million apps), standing out from the pack matters. For companies who don’t necessarily have the capital to invest in great UX designers, chatbots present themselves as a great alternative. A chatbot helps businesses fill a lot of the gaps if they don’t have a great UX/UI. Drive better engagement by interacting with your customers, targeted campaigns allow for higher conversions, 24/7 availability helps you acquire more leads and hopefully, more sales. But what can you achieve when you combine great UX design with great conversational automation? Enter Conversational User Experience. In this article, we’ll tackle two big questions. 1. What defines great CUX? 2. How can you build a great cux? Bots have the potential to revolutionize the way we think of customer loyalty. A human-machine interface so realistic, every conversation becomes a personalized pitch. At the core of every one-on-one conversation is a replication of an interaction with a real human being. The best user experience is one that requires little effort but produces a lot of gain; in essence, a human conversation. User expectations for an alternative product/service are based on prior experience. You gauge the ease of use and performance of one website based on your experience with another. Meaningful dialogue is the crux of great user experience. Great chatbots keep their messages short, to the point and universally understandable. Much like with SEO for long tail keyword blog content, you are scored for metrics like the ease of reading, length of sentences, and complexity of words. Users expect a lot from Chatbots. Till the turn of the century, conversation was exclusively restricted to human beings. And humans don’t incessantly blurt out, “sorry I don’t understand that could you try again” when they can’t answer a question. The best chatbots are those with a human-like personality, a life story, and visual identity. They admit imperfection and advertise their strengths. The ideal chatbot also incorporates a healthy amount of images and gifs. It eliminates as much redundancy as possible; i.e. you are better off running an integration that identifies customers who are logged in than having your customer fill in their credentials. However, the people who build bots (developers) are not necessarily the same people as the people who use the bots (customers). This gap in knowledge leads to everything from hyper-simplification of chats to built-in overcomplexities. A frustrated customer is often more dangerous than no customer at all. Users can be peeved because the bot can’t understand what they’re saying or are creeped out by random responses that the bot throws out. You want your customer to give you as much information as possible, but you want to ask as few questions as you can. Feedback is always appreciated and should always be collected. So how do you go about building a CUX that incorporates all of this into a Chatbot? Follow a seven-step checklist, of course. The first step to build a great chatbot is to identify its purpose. Is it lead Generation? Visitor Engagement? Customer Support? Domino’s Pizza bot allows users to order pizza; Flo from Progressive produces an auto-insurance quote. Nykaa’s bot helps users with return, refund, and cancellation. As a CUX designer, you should begin by identifying the value a chatbot will bring to the company. Reference this learning throughout the design process through user-centric design techniques, such as research and ideation. Leave room for expansion too. Often, companies begin with a pilot use-case and gradually expand to more encompassing responsibilities for the bot. Customers don’t want to feel like they’re talking to a robot; they want insightful, thought-provoking conversation. Think about some of the most fun text conversations you’ve had. They involve silly selfies, lots of emojis and context-specific gifs. Build personality cards for your bot, so you can provide consistency and articulate the nuances of your bot’s behavior. On average, companies with mascots significantly outperform those without mascots. So by giving your chatbot a personality, you better nurture a relationship with your customer. One of the areas in which chatbots are faulted is that they fly in the face of traditionally effective user interfaces, like GUI’s. By using gifs, emojis, and buttons, you address these concerns and make the bot more universally personable. But balance it with the purpose that you established for the bot in Step 1. For example, a chatbot for a financial institution probably embodies a more restrained persona than one for an indie t-shirt store. Step 3 – Cut down on entry fields. Fill-in forms have some of the lowest conversion rates of any modern lead capturing tool, bottoming out at a measly 1%. Forms expect customers to undertake an effort to help the company get in touch with them, a failure of incentive structure. Chatbots are largely the same. While typing is great interface experience, having to type all the time is annoying. So skip the obvious questions. Ensure repeat customers don’t have to fill-in fields every time they visit your website. This allows them to get in and out of your system faster, and on to the more important things in life. Take, for example, a chatbot that allows users to order pizza. First-time customers will need to provide necessary details like name, phone number, address, and pizza preference. Repeat customers, however, should be able to use a single tap authentication and be able to go straight to ordering pizza. Not only does this fulfill the purpose of the bot to ensure a hot pizza at their doorstep ASAP, but it also makes for a smoother, more intuitive experience. While you can aim to make your Chatbot as human-like as possible, it is still a machine. To that end, there will be times where the bot will falter. If a customer has broken out of your recommended flow, you don’t want the chatbot to be all alone fending for its life. Integrate your chatbot with your clients CRM tool to ensure smooth ticketing, escalation, and fulfillment. Designers should assume users are unable to understand technical terminology, therefore, error messages should almost always be expressed in plain language to ensure nothing gets lost in translation. One of the ways to reduce potential frustration is to ensure more than one error message. A more long term solution is for a conversation to be flagged and have a human step in when the bot fails on consecutive attempts. 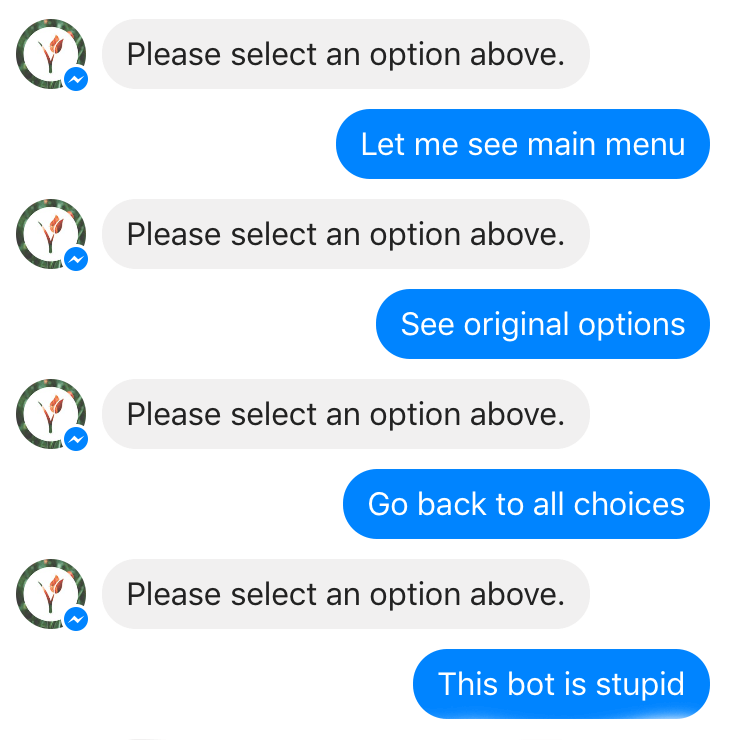 As they stand right now, Chatbots are very passive. Short of popping up as a notification while you’re on the website, Chatbots have very little in the way of starting a conversation. You want customers to be involved right from the start of the conversation. A simple hello is not enough to engage the user to ask questions or engage your base. You’re going to need to use personalized user engagement, and data is the best way to do it. Repeat customers should see different triggers than new prospects. Someone on your help page has an entirely different problem than someone who’s on your pricing page. From simple changes, like good morning or good afternoon when either appropriate. Follow the heuristic principle of UI design and let users know where they are in the system, and what’s expected of them. One of the easiest ways you can find out if your chatbot is relating to your user is to ask them. Open-ended questions are the best and will give you as a developer the valuable information you need to improve your chatbot. CSAT scores are a great way to disseminate end-of-experience results. A score of 3 and below requires manual followup. Interactions that score 4 and 5 should be pushed higher up the flow cycle. Consider implementing a Google Assistant style feedback system for FAQ’s asked. Google Assistant offers a similar way to receive constant feedback. A thumbs up and thumbs down emoji appear as quick reply buttons so users can respond at any point. This way, if the user isn’t satisfied with the chatbot’s response, they can send a thumbs down emoji or a feedback message. Step 7 – Test, and then test a bit more. There is no shortage of horror stories of companies who believed their design would change the face of the industry only to have it blow up in their face. From tech firms like Snapchat, to FMCGs like Tropicana and chatbot apps like Digit, they’ve been victims of un-consumer focused designs. Testing is the most important part of good CUX. Set metrics based on the purpose you defined in Step-1. This could range from conversion rate (traffic to end goal), engagement time (minutes the bot kept the customer engaged), ARR/ART (average response time between user and bot) and the number of tickets raised. Intent addressal, cross-language support, latency in response retrieval and accuracy are all common problems bot designers need to quantify and account for. Release your Chatbot through alpha and beta testing while establishing variance in the kind of testers you get.